Staff: Full-time rink guards, very polite. Also entertainment staff: Free Skate Thursdays, with free skate rentals courtesy of Billy Bishop Toronto City Airport, and free skating lessons courtesy of The West Toronto Skating Club. Maintenance: Zamboni, as needed. Ice is always good there. Note: holiday hours are longer: Sunday to Thursday 12 noon until 9, Friday and Saturday 12 noon until 10 p.m. 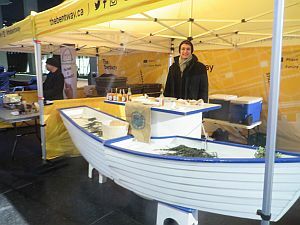 Supported by the City of Toronto, the Government of Ontario, Billy Bishop Toronto City Airport, Ontario Tire Stewardship, Kahlua, Inniskillin, Fisherman’s Friend, and Waterfront Toronto. Lineups for free Kahlua-and-coffee. Very nicely done, with lots of seating around outdoor fires. 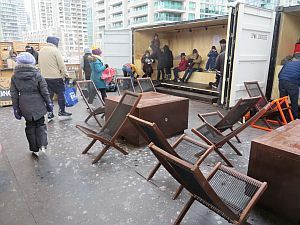 People have discovered the warming sheds -- many cozy scenes of people looking sleepy and warm. The rink had a lot of people today despite the cloudy weather. There can be a wind-tunnel effect at this rink although today there was hardly a breeze. 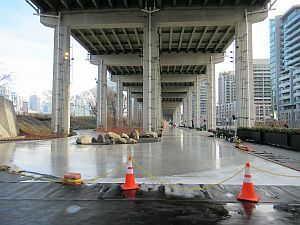 But it seems that the Bentway is prepared for the cold that's bound to come. 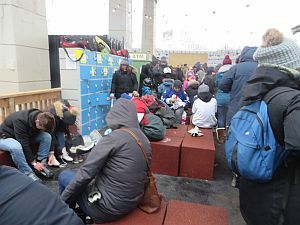 The indoor space was packed with people changing their skates, but as soon as people realize that the outdoor sheds are warmed -- particularly the one with plastic strips to keep the heat in -- they'll surely migrate to there. 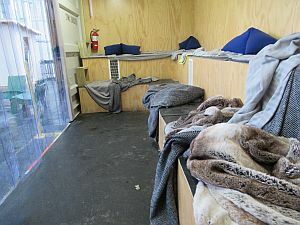 It's as cozy as a play fort, with lots of furry blankets to warm up cold toes. 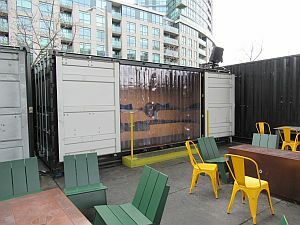 The warming sheds are beside the food-and-drinks booth, run by a company called 232 Productions. They offer coffee and hot chocolate but also alcoholic drinks and chili and leek-potato soup. 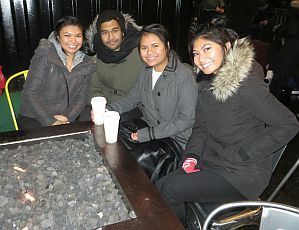 A coffee spiked with Kahlua costs $9, not super cheap but another way to warm up, for sure. Even though it was only 11.30, the locker room was open and skaters had begun arriving (holiday hours begin at noon). The staff at this rink are remarkably friendly. The staff said there are about 30 people signed up for the polar bear skate already. The website advertises an event next Sunday Dec.30, the polar bear skate, when "skaters will strip to their intimates and Skate the 8 in their knickers! 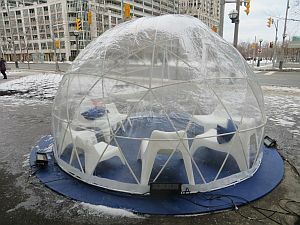 All pre-registrants receive a free hot chocolate and a chance to win a special Bentway prize pack." 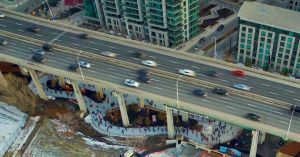 The Bentway Facebook page has posted this video. The skating trail opened for the season today at noon. Only two days until opening. 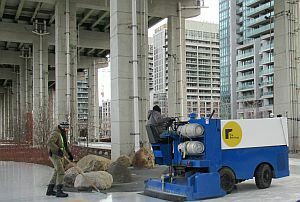 The zamboni has the Bentway logo on it. 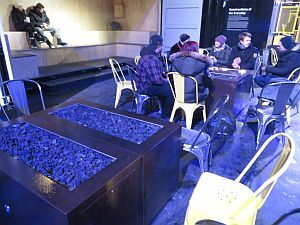 There were lots of staff around, getting the rink ready to open, putting out the seats, conferring, doing last-minute carpentry. A nice man named Jim waved to me as I was taking a picture, and invited me to come in and take a look at the equipment. A surprise. 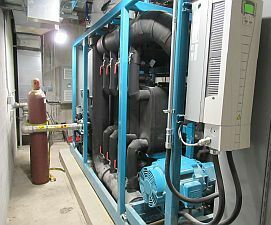 The rink staff at the municipal rinks usually behave as though the machinery room were a nuclear facility, and anyone who wants to have a look might be dangerous. But this is definitely not a municipal rink. 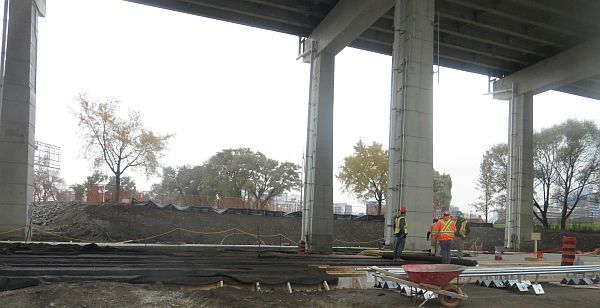 From a Bentway media release today: the rink is planned to open on Dec.21. 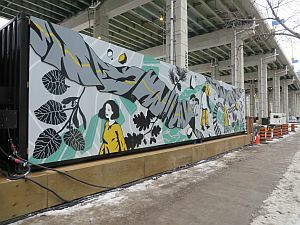 "Skate rentals and skating lessons will be offered again this year, there will be curated food and beverage options on select dates, and an expanded winter village full of snuggly blankets, warming lounges, and fire pits." 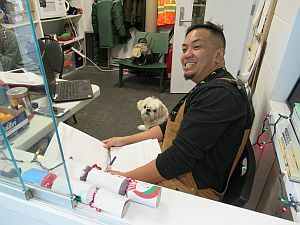 On a windy November Saturday morning after an all-night rain, there were not a lot of people out, but even so, tables and chairs were set up, the washroom doors were open, and there was a very friendly staff person inside the office. Like the staff from last winter, he seemed to be very invested in the site, proud of how it looks and its program offerings. Maybe that's partly because he lives in one of the condo buildings nearby -- it's his neighbourhood. 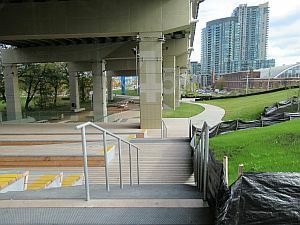 The Strachan end of the Bentway looks like it's finished now, except for the protective fencing for the new plantings. 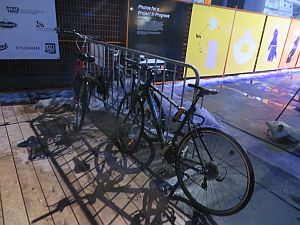 It's all accessible -- and that means for bikes as well as strollers and wheelchairs -- ingenious, considering how steep the drop is from Strachan. 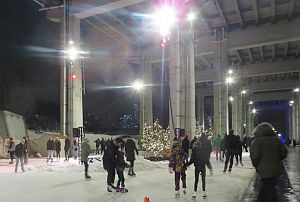 The Bentway website promised a romantic skate for Valentine's, and they did their best. The rink was beautifully lit up. 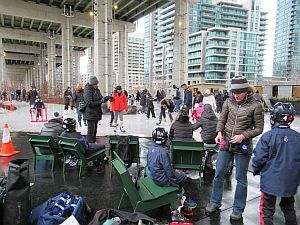 Despite the crowds there were plenty of places to sit, there were good-quality skates and even skate-aids to rent, there was music, hard cider, coffee and hot chocolate, and cheap food. Ultimately, of course, romance depends on two, and can't be bought (true love is free), and not everyone there looked like they were happy with their date (or even had a date). But that's not the rink's fault. Skating trails do have a problem -- people tend to bunch up behind slow skaters, and good skaters often can't find a place to stretch out and show their stuff. Whether the vogue that such trails are having at the moment will stand the test of time, remains to be seen. 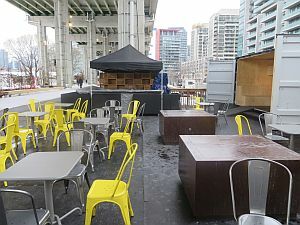 There were cheap snacks -- the oyster guy said that the $1 oysters would normally cost $3.50 apiece -- but since the Bentway is still very much under construction, they don't have much choice but to subsidize the food. Perhaps the indoor area that's due for completion in spring will have a kitchen where snack food can be prepared. 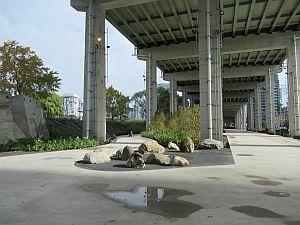 The most noticeable thing about the Bentway for cityrinks.ca visitors is the friendliness of the staff. Everyone who is approached seems eager to be helpful. This is in striking contrast to most of the rinks run by city rec staff, who -- not always but far too often -- seem to see their job as stopping things. Your four-year-old is using a bike helmet to skate? -- she must leave the rink at once, only hockey helmets allowed. You want to take a picture? -- only if there is no one other than your direct relation in the frame. At many rinks the city rec staff actually stop people from taking a photo of an empty change room -- they say their training taught them to stop any photography. No reason except "orders." At the Bentway, in contrast, the staff are rink-proud: yes, take a photo, yes, I'll smile for your photo with my Bentway toque on, isn't this place amazing? Their enthusiasm is contagious. 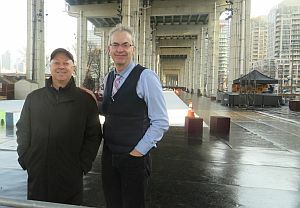 the rink in the morning light, 10 a.m.
A chat with the Bentway marketing staff. She said there are many things still left to do -- the washrooms aren't done and neither is the zamboni garage. 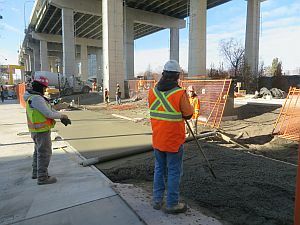 To open on time, the construction workers had to pour concrete in very cold temperatures -- not easy working conditions. 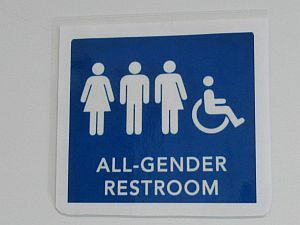 There will be an interior space near the washrooms where people can warm up and maybe even get a snack. And the space will be extended right over to Strachan Avenue. 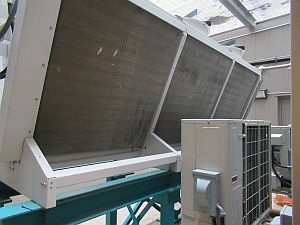 There are estimated to be over 2000 children living in the various condos (really?) and there will be an effort to make the space work for them too. 7 p.m.: A windy Friday evening, but lots of skaters. A DJ tent is set up, with music to begin at 8 pm. 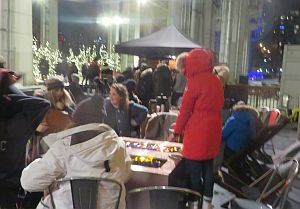 The staff are trying to light the second charcoal fire tables, but no luck -- the wind just blows it out. The Strongbow cider people say that the rink is a wind tunnel and they hope some wind blocks can be devised. The skate lending shed still has its tarp to shield the opening, but they hope a glass barrier will be put in soon. At 11.30 there were skaters, mostly skating alone, looks like most were doing laps. There were a few construction workers skating, on their lunch time. It's a space of strangers, of course. The only staff person in sight was a security guy working his cell phone. No host. 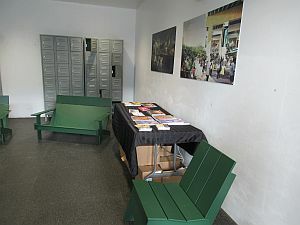 No food, either, but the shed benches are comfortable for eating a packed lunch, and there are plenty of chairs everywhere, unchained. There's no bus stop in front. A much nicer, warmer day. Monday night is free skate lending. This time the booth was not mobbed. The supply of skates is very good and they look new. The company (City Skate Rental) is the same as at City Hall, in Brampton, and at two rinks in Mississauga. 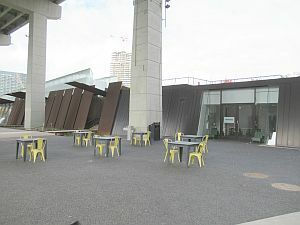 The owner was there tonight, and says she's very pleased with how the Bentway is treating the company. The skate lending booth is four times the size of the crowded spot they have at City Hall. Today was the mayor's skating party. Even though the rink officially opened yesterday, this was the first day in almost two weeks when the temperature began to rise. Lots of people came to the rink. But the wind was strong -- a wind tunnel -- and very cold. There was no sign of the warming stations announced in the press release. 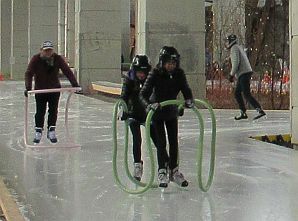 But today was really the inauguration of the new rink, and Artscape may need some time to get the bugs out. A skater's comment: It’s a nice little rink but it’s funny that they made the turns so tight. You have to be a pretty confident skater to go around those at any speed. 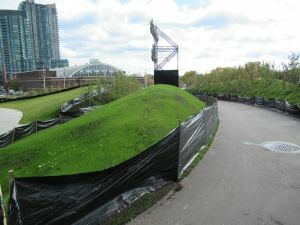 It looks like the amenities are a work in progress as well and typically for the city no thought was given to the 25,000 people who may have wanted to walk from Liberty Village. Those unshovelled Strachan stairs are a menace. Still, nice to see the new amenity. Good news! 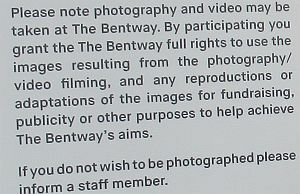 The Bentway Press release says there will be skate rentals. 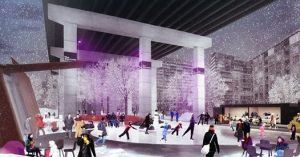 Also from the press release: A skating village, designed by +tongtong, will be installed at The Bentway and will house the skate rental shop, warming stations and a variety of seating options. 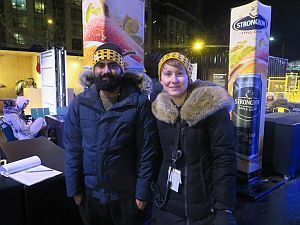 On weekend evenings, skaters are invited to warm up in the Strongbow Lounge, which will be serving up Strongbow Apple Ciders and other fine Molson Coors products. 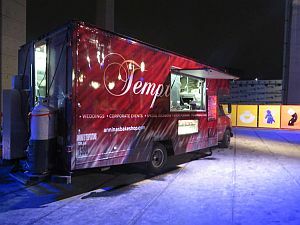 A curated food truck program will serve hot food, warm and cold drinks, and decadent desserts. 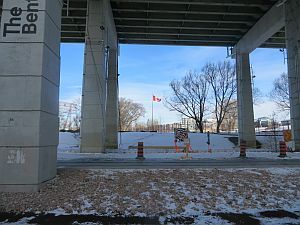 At present, The Bentway is not in a position to secure our own skate collection, but we wish you luck and hope you find a fantastic home for the skates donation! Obviously they realized later that in order to have people come to their rink, they should have skate lending. 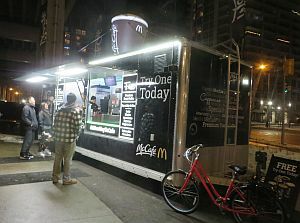 So they have it every day (the cost is not yet publicized) and on Mondays it's free. 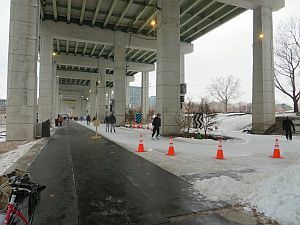 At 11.30 a.m. on New Year's Day, it's -13 celsius but feels bitingly colder -- the wind is ripping along the Bentway and it's hard to imagine anyone wanting to skate there whenever the wind is like this. 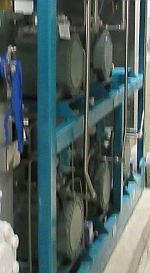 Jan.1, 2018-- A wind tunnel? 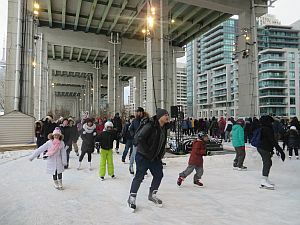 Fort York celebrates the opening of The Bentway's Skate Trail with FREE admission and extended hours all weekend-long! 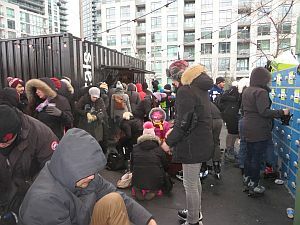 Join in some family-fun activities in the Fort York Visitor Centre, including a special pop-up exhibit on winter fun in Toronto, and a Fort York selfie booth. More details below. Saturday, January 6, 10 a.m. to 11 p.m.
Sunday, January 7, 10 a.m. to 6 p.m.
Saturday, January 6, 6 p.m., 7 p.m., 8 p.m. and 9 p.m.
See Fort York in a 'new' light! Missed one of our daily tours? Join a special lantern tour and catch a glimpse of garrison life after dark. Our interpretive staff will guide you through a selection of Fort York's War of 1812-era buildings using exclusively 19th century lighting. These FREE tours meet in the Fort York Visitor Centre on the hour from 6 p.m. to 9 p.m. Saturday only- don't miss out! Spaces are limited. January 7: Fort York will be open until 6 p.m. to celebrate! With tours throughout the day, there's plenty of opportunity to explore the history of Toronto's founding urban landscape – before or after your skate! 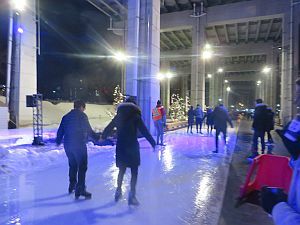 I'd love you to join me on January 7 from 1 pm to 4 pm for a skating party on The Bentway's new skating path (250 Fort York Boulevard). 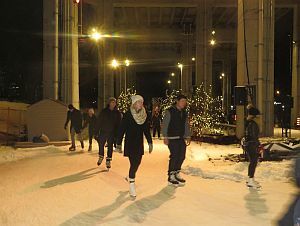 It's the Mayor's Skate Party so there will be complimentary skate rentals, hot chocolate and good family fun. 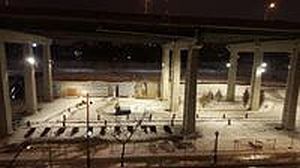 City Council has approved $500,000 to go to the Bentway, to expand the skating trail. The rink area is swarming with workers. 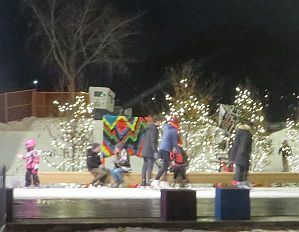 Compare with Riverdale Rink, which looks almost done and yet the website postpones its opening date until January -- and like many city construction sites, seems to have a dearth of workers onsite. 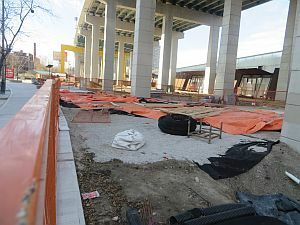 The workers at the Bentway seem enthusiastic, too -- "we'll get it open by Christmas!" Will you have skates for rent? We assume yes. 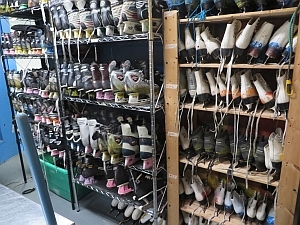 In case this is of interest, CELOS has a 110-pair travelling skate collection that we now want to donate to an outdoor rink. The city's recreation division says they don't want to do any more skate rental (Metro News story this morning). If you can use them (many of the skates, donated by the NHL Players' Association, are almost new), let us know. In the next couple of weeks we will send out an official announcement about winter season, including opening celebrations, hours of operation and on-going programming. 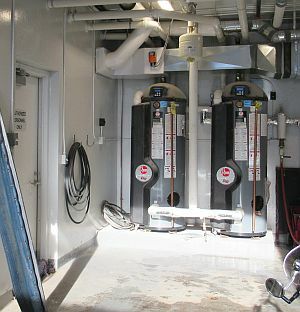 We’ll be sure to send this on so that you can update the cityrinks.ca website as needed. You can reach out to Kasia at [email protected] for more information. 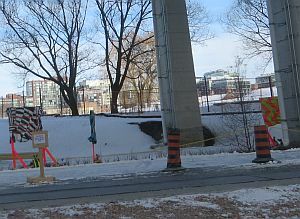 The construction scene was very active, and it looks like the trail is in good shape. 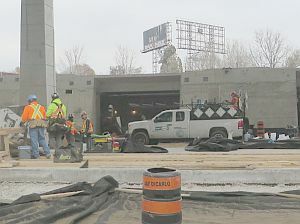 The worker I talked to seemed proud, and said the pipes are in, the concrete is poured, the compressors are ready to fire up, and he heard they're trying to open by New Year's day. 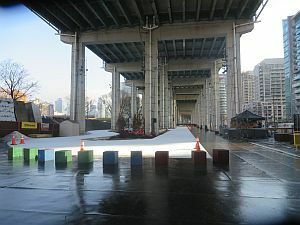 will it be strange to skate under a highway? 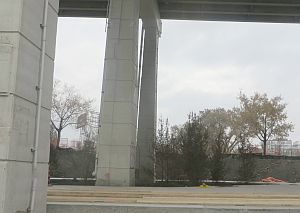 The Urbantoronto.ca blog about the rink is here, with some good, clear pictures. This rink is a hidden jewel! It's a beautifully designed, sunken rink in the round just off Yonge Street, behind offices and shopping, with landscaping around it. One of the last rinks to be built during the tenure of visionary Parks Commissioner Herb Pirk, this rink was mothballed all winter in 2002 because of a minor problem in the cooling system. Nobody complained! 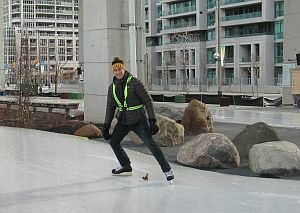 Very few people use the rink despite its proximity to Ryerson University and some major hotels. It's an orphan, waiting for adoption.